On their 17-day Chile trip, sisters Sue and Barbara made the most of their time in Patagonia by trying out two different lodges near Torres del Paine before continuing on to the Lakes District in northern Patagonia. 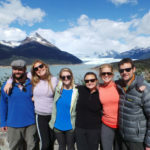 Read on to see how they spent two weeks in Patagonia. Following a short time in the lovely seaside town of Valparaíso, Sue and Barbara were off on their two weeks in Patagonia adventure. Their first stop was at EcoCamp, where travelers can experience the natural surroundings while staying in individual dome rooms. These eco-friendly accommodations even include windowed ceilings, so you can enjoy the night sky. 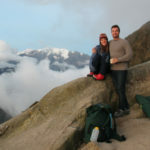 Then they continued on into the national park, where they began their stay at Explora Patagonia. While at Explora, they had a wide variety of hiking and horseback riding excursions to choose from to explore natural wonders of the park. After their time in southern Patagonia, Sue and Barbara headed north to Puerto Varas and Chile’s Lakes District. 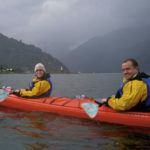 While in the region, they explored Lake Llanquihue and Vicente Rosales National Park, seeing the beautiful Petrohué waterfalls and the surrounding volcanoes and hiking through the forests. With their time in Chile coming to a close, they returned to Santiago for a whirlwind tour of the city before returning home with heads full of memories and cameras full of photos. Do you want to travel to Patagonia or Chile? We’re regional experts here at Knowmad Adventures and pride ourselves in building custom trips that are a perfect fit for our travelers. If you’re interested in crafting an adventure combining several regions in Chile but this particular itinerary doesn’t strike your fancy, don’t hesitate to reach out to our Trip Specialists at 612-394-2894 or travel@knowmadadventures.com to begin planning your trip today! Upon your early morning arrival you will be met at the Santiago airport by a Knowmad Adventures representative. After both travelers have arrived, you will head west on an approximately 90-minute drive to the coastal city of Valparaíso, declared a UNESCO World Heritage site in 2003 for its architectural and cultural significance. Enjoy a full day guided exploration of Valparaíso, where the picturesque layout enhanced by the surrounding hills that dive into the ocean remind us that it was once the most important South American seaport of the Pacific coast before the Panama Canal was opened in 1914. You will visit both the downtown and the colorful hill neighborhoods of ‘Valpo’ where century-old hillside ascensores (elevators) rise up into the city’s steep hills and a labyrinthine maze of streets reveals brightly colored buildings, bohemian cafes, elegant restaurants and spectacular views of the harbor below. Your optional lunch (to be paid directly at restaurant) in Valparaíso will also be nestled in the beautiful hills. On this day you can also visit La Sebastiana museum, one of the poet Pablo Neruda’s houses, reveling in his chaotic furniture and art collections as well as his poetry. After your guided exploration of this unique city you will be transferred back to your accommodations in Santiago to enjoy the evening at your leisure. In the morning you will be met at 7:20am at your accommodations and assisted in crossing the street to the Santiago airport and checking in for your onward flight to Punta Arenas (please have your bags packed and be ready to depart). Upon arrival you will be met at the airport by an EcoCamp representative, enjoy a light lunch, and be taken in group transfer on the approximately 5-hour scenic drive through Puerto Natales and onward to Torres del Paine National Park. Enjoy your stay at EcoCamp, where you will be able to choose from a wide range of adventurous activities. EcoCamp Patagonia is immersed in the flora and fauna of Torres del Paine National Park, with views of the majestic granite towers and excursions available for every traveler. 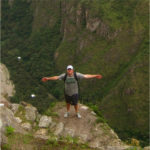 Excursions are offered at a variety of physical rigor and can include nature walks, wildlife viewing of herds of guanacos and native birds, bike excursions, treks through rock valleys and to the Salto Grande waterfall, yoga and more. Enjoy the panoramic views of the startling blue lakes, glaciers and rock formations during your stay at EcoCamp Patagonia. Continue to enjoy your adventures throughout the region and your stay at EcoCamp. In the morning after breakfast you will be met at EcoCamp by an Explora representative and transferred to the lodge on the shores of turquoise Lake Pehoé (exact pick-up time will be communicated to you the day prior by EcoCamp staff). While at Explora Patagonia you will be able to choose from a wide range of adventurous excursions, as well as enjoy gourmet food and a range of wines and alcohol as part of your adventure inclusive package. Park highlights include the Grey Glacier, the French Valley, and the Base of the Towers in addition to horseback riding and other hidden gems. Your onsite Explora guide will explain the multitude of options upon arrival, as well as aid you each night in planning out your activities for the next day. After enjoying the morning at Explora, in the afternoon you will be taken on the approximately 4-hour transfer to your accommodations in Punta Arenas, a short walk from the main square as well as the shores of the Strait of Magellan, to enjoy the evening at your leisure. In the morning you will be met at your accommodations at 8:00am (please have your bags packed and be ready to depart) and transferred to the airport in accordance with your onward flight to Puerto Montt. Upon arrival in Puerto Montt you will be met at the airport and taken to your accommodations overlooking Lake Llanquihue to enjoy the afternoon at your leisure. Today you will be met at your accommodations at 8:30am by your guide-driver to embark on a full day privately guided exploration of the beauty surrounding Lago Llanquihue. \First you will drive along the picturesque shores of the lake towards Ensenada, where at a nearby lookout you will soak-in the incredible views of the Lake District below and the majestic Osorno and Calbuco volcanoes. Descending from this viewpoint you will arrive at the El Solitario trailhead in Vicente Perez Rosales National Park, where your guide will lead you on a hike through native forest and lava formations. Along this approximately 6 km trail, enjoy beautiful views of the volcano and lake as you climb and descend with the varied landscape. At the end of your hike you will continue to the beautiful Petrohué falls, a frothy waterfall through volcanic rock canyon in Chile’s first national park. In the afternoon your guide will take you to Los Ulmos Valley for a unique and special visit to natural lands at the foot of the Calbuco volcano. As your guide highlights different aspects, witness the recovery process of the flora and wildlife after the volcanic eruption of April 2015. The nearly 900-acre ecological reserve has a wide variety of vegetation such as ferns and coigües, as well as one of the oldest and most extensive forests of the Ulmo tree. Perhaps even see a fox, hummingbird or hare as you admire the views of the Calbuco, Osorno and Puntiagudo volcanoes. After your day excursions you will be transferred back to your accommodations in Puerto Varas. Today you will be picked up at your accommodations at 8:30am and have your guide-driver and private vehicle at your disposal for up to ten hours with a 400-km radius and boxed lunches provided. Enjoy the day exploring the region, before being returned to your accommodations in the late afternoon. Today you will be met at your accommodations at 10:05am (please have your bags packed and be ready to depart) and transferred to the airport in accordance with your onward flight to Santiago. Upon arrival you will be met by a Knowmad Adventures representative at the airport and taken to your charming accommodations in the thriving and vibrant Lastarria neighborhood. Enjoy the morning at your leisure. At 2:00pm (please have your bags packed and with you as you will not be returning to the hotel) you will be met at your accommodations to enjoy a half-day guided exploration of Chile’s capital city, Santiago. 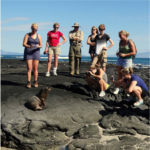 As this is a privately guided excursion you will be able to have your exploration custom-tailored to your interests as you go along. Your guide may suggest leading you through the beautiful park on Santa Lucia Hill, the governmental seat of Palacio La Moneda, the House of Justice or the National Parliament. Along Plaza de Armas, the main square, you can visit the Cathedral and view the majestic architecture of the Post Office and governmental buildings. Enjoy sightseeing and people watching in this city that has been bustling with life from colonial times through present day. Following your exploration you will be transferred to the airport in accordance with your international overnight flights home.